Our first two trips to Fond Blanc, in 2013 and 2014, were spent working on construction projects around the orphanage. 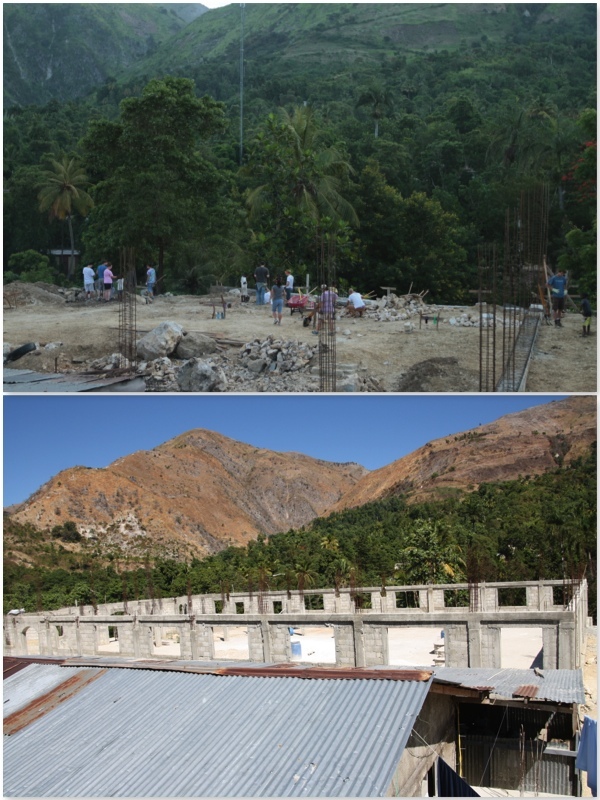 In the summer of 2013, we found ourselves helping with the foundation of what is to be the new church that will serve both the orphanage and the 7000 person community of Fond Blanc. But work on the church is now halted as more important orphanage needs took priority for the Next Step Ministry staff that is in charge of our summer mission trips. On our summer trip in 2014, we helped to lay the roof and floor of the teacher’s quarters. The orphanage is also home to a school that serves as many as 250 local children. Unfortunately, attendance by the teachers is inconsistent. When teachers do not show up it falls to the older kids, maybe only 17 years old themselves, to teach the younger children. It takes only one look at the conditions of life in Haiti to know that education is vitally important if the children are to rise above a life of struggling for daily subsistence.Proper housing will allow adequately trained teachers from Port-Au-Prince (2 hour ride up the mountains) to stay overnight while school is in session. After our most recent summer trip, something within us changed. We saw the need for more than just the assistance from summer mission trips; we recognized the need for permanent change. After many months of discussion and organization, this change took shape in the form of what is now called the Fond Blanc Foundation. 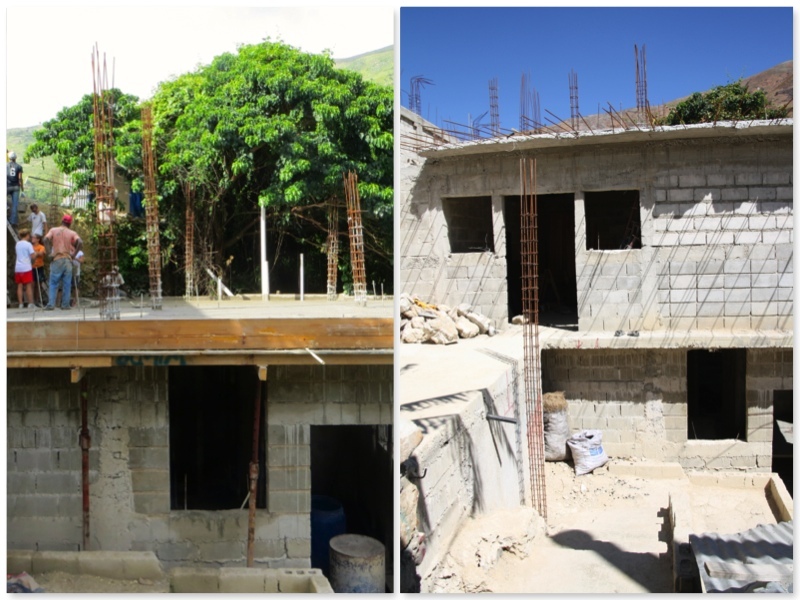 Many teams of volunteers will continue with the building efforts during the summers, but rather than focus on adding physical buildings, the Foundation wants to focus on developing and maintaining what these 54 children will need to have a successful life. Our focus is broken down into 4 main areas: Love & Basic Needs; Health & Nutrition; Education; and Spiritual Development. All 54 children were being cared for by 1 individual. I’m not a parent, but I do have experience with children and I know that even showing love, care, and affection for 1 is hard…I can’t imagine 54! It was simply not possible to nurture all the kids sufficiently. There was not always enough money to buy food for the children. This could mean days without adequate nutrition and maybe not even a meal on some days. The only reliable funding for food came from a single $500/month contribution. Proper nutrition costs about $3000/month, so for much of the time the children lived on rice and beans. The educational shortcomings are revealed by this fact: there are children in the orphanage school who are over 18 but only at a 2nd grade level in school. Teachers were not consistently showing up, books are scarce, supplies are almost non-existent and the approved curriculum costs funds the orphanage did not have. Spiritually, the children are led and pastored by dedicated evangelical Christians, but the practice of Vodou is widespread, and is even accepted by some Christians. We are in the early stages of getting going as the Fond Blanc Foundation but the changes are already being noticed….even by the children! We were honored to be a part of the conversation in which the children learned for the first time about the Foundation and our new Child Sponsorship program. Several of our summer team members now serve as part of the Fond Blanc Foundation. Not only did we miss the children (and couldn’t wait until next summer to see them again) but we felt we needed to be on site for logistics and details to help serve them better. So we planned our winter trip. Our main goals upon returning to Haiti this winter, outside of the obvious in seeing the children, were to start our child sponsorship cards; to implement a routine of vitamins and medicine to care for the current health concerns (scabies, ringworm, and lice); and to label and hand out sheets, underwear, and mattress pads. This trip was different. Because our focus wasn’t solely on finishing a project we were able to concentrate directly on the needs of the children. None of us were prepared for the way this new focus has already deepened the bond with the children and with the Haitian staff. We all felt unified in a new way – not as Americans or Haitians, but rather, as a family! 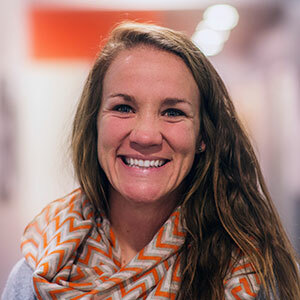 Alison Praisewater, our new Director of Operations, who now lives at the orphanage. 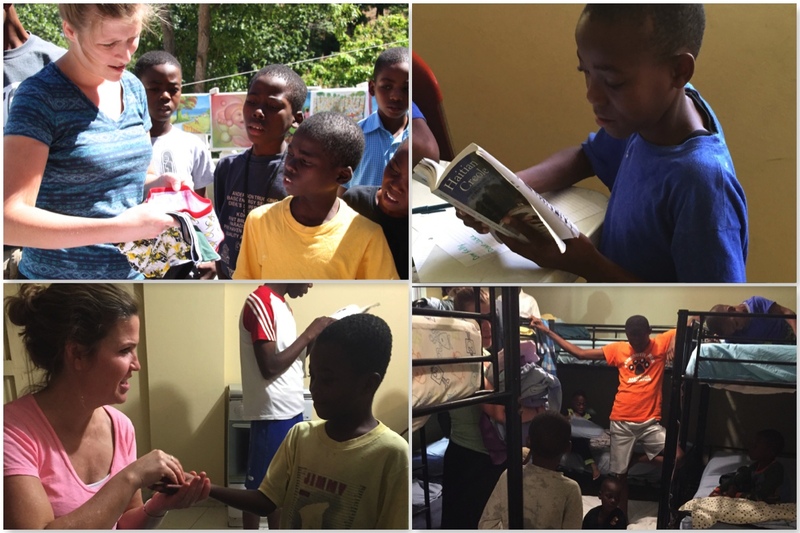 Alison has given up the comforts of America to live life in Haiti and be a surrogate mother to these 54 children. While she is only one person, the way in which she has changed their lives is immeasurable! She is truly the rock to this Foundation and a big part of the success we have already seen. The heart and character of the children. There is no better way to describe their selflessness than the monthly birthday celebrations. Each child whose birthday falls in the month is allowed to invite one friend to share in the cake, so we had about 10 kids to share 1 cake. The beautiful part was that every single child was given some of the cake. Those who were given “their” piece all ended up sharing with other children. Franklin was even seen with the cake plate, sharing what little he had (basically all the crumbs) with everyone else. Their care and generosity toward one another is something special. The opportunity and privileges I have living in America. It is easy to take our lives for granted. Haiti changes all that. The symbiotic relationship between the Haitians and our group. When we first traveled to Haiti, we believed we were going there to make a change for the lives of the children. Apparently they changed our lives even more. This new relationship calls each of us to be a better individual. Living life for something greater than myself, a faith and belief in God and serving Him. As powerful as trips to Fond Blanc always are for me, I am not sure I can fully explain the magnitude of the effects this experience has had on my life. I know that I am forever changed and I hope my life will always be consumed with making the lives of my 54 Haitian children better. Let me close with these two videos of the voices of these children. A sense of peace and comfort fills me as they sing “How Great Thou Art”.